What beauties! I think a few lighter greens across the quilt is OK–and suggests light filtered through the rose "bush." 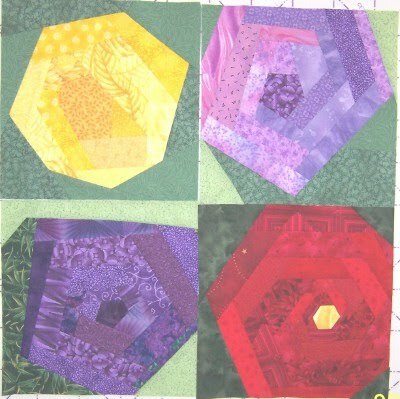 Strictly speaking the yellow center in your red rose breaks the rules–don't change it, but if you decide to make more blocks this month … no more rule breakers, OK? I've added your blocks to the list. Our new total-so-far for August is 24 blocks. I guess I didn't read the rules close enough. I will redo the red rose without a yellow center.